Zoledronic acid may be able to help treat malignant pleural mesothelioma and combat bone weakness from chemotherapy. Zoledronic acid is commonly used to treat patients who have osteoporosis. In a recent study, researchers from the University of Alabama at Birmingham Comprehensive Cancer Center discovered that zoledronic acid helped shrink mesothelioma tumors with no treatment related toxicities. The primary objective of this study was to evaluate antitumor activity of zoledronic acid in patients that have unresectable and advanced malignant pleural mesothelioma. Pleural mesothelioma makes up about 75 percent of all mesothelioma diagnoses. The study also tested the safety of zoledronic acid and how well patients with malignant pleural mesothelioma could tolerate it. Eight male patients were treated during the study. The median age of the patients was 62. Mesothelioma occurs more often in men than in women. Patients were treated with an intravenous infusion of zoledronic acid. Each patient received their medication on day 1 of a 3 week cycle. Researchers monitored the patients’ response to zoledronic acid after they completed 2 cycles of treatment. If a patient’s disease was stable or it responded to treatment, they were able to stay in the study. At the end of the study, researchers discovered that there was a great success in treating malignant pleural mesothelioma patients by just using zoledronic acid. 37.5 percent of the patients benefitted from zoledronic acid treatment. Many of the patients experienced either a reduction in the size of their mesothelioma tumors or their mesothelioma tumors temporarily stopped growing. Researchers were also impressed that patients didn’t experience any treatment related toxicities while receiving zoledronic acid. Zoledronic Acid is a medication used to treat high blood calcium levels that may be associated with cancer. It is also used in combination with chemotherapy to treat bone problems that may happen if a patient’s cancer spreads to their bones. This medication lowers high blood calcium levels by reducing the amount of calcium released from your bones into your body. As previously mentioned, zoledronic acid is used to treat osteoporosis. This disease occurs whenever a person’s bones become too brittle and they break. A mesothelioma patient may experience bone damage or they may develop osteoporosis after receiving chemotherapy. 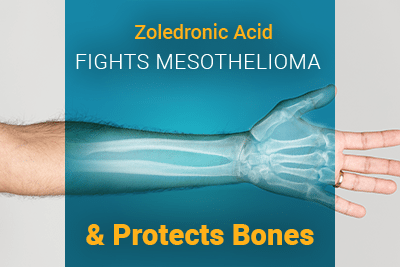 It is quite possible that by using zoledronic acid during treatment, that it could not only help combat mesothelioma, but it could help protect a patient’s bones. A pilot study of zoledronic acid in the treatment of patients with advanced malignant pleural mesothelioma. NCBI. Retrieved from: https://www.ncbi.nlm.nih.gov/pmc/articles/PMC5476579/. Accessed: 07/06/2017. Zoledronic Acid Vial. WebMD. Retrieved from: http://www.webmd.com/drugs/2/drug-21754/zoledronic-acid-intravenous/details#uses. Accessed: 07/06/2017. Mesothelioma: Statistics. Cancer.net. Retrieved from: http://www.cancer.net/cancer-types/mesothelioma/statistics. Accessed: 07/06/2017. Osteoporosis. Mayo Clinic. Retrieved from: http://www.mayoclinic.org/diseases-conditions/osteoporosis/home/ovc-20207808. Accessed: 07/06/2017. Long-Term Side Effects of Cancer Treatment. Cancer.net. Retrieved from: http://www.cancer.net/survivorship/long-term-side-effects-cancer-treatment. Accessed: 07/06/2017.